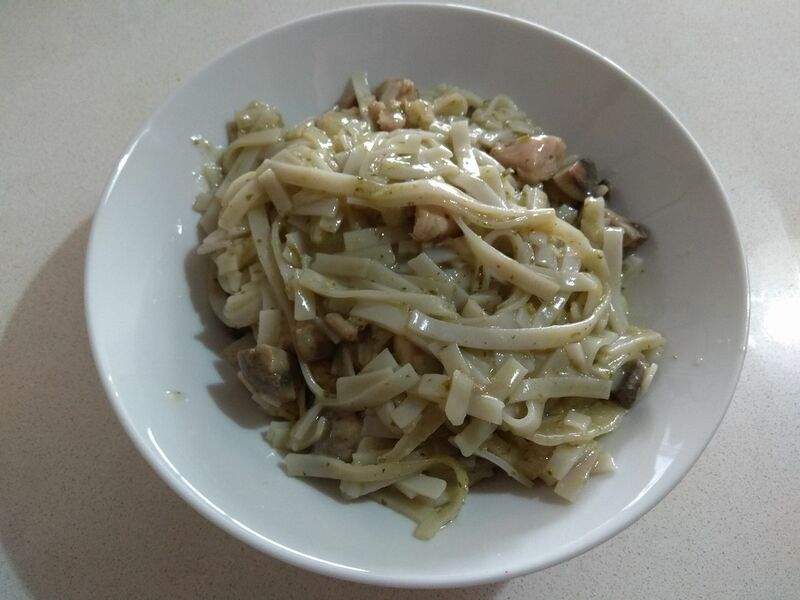 Recently I went out to eat at a restaurant, and had two dishes based off of Thai green curry paste- noodles with mushrooms and chicken, and corn soup. I recreated my own homemade Thai green curry paste, and with that, I easily recreated them both at home. I made a huge amount when I made this recipe- it was enough for 3-4 meals for my family of 6 (it completely filled my large cast iron dutch oven to the very top), so I am am sharing the recipe halved. At the restaurant, this dish was able to be ordered with chicken, salmon, or tofu, so if you want to make this meat free, feel free to replace the chicken in this recipe with either firm tofu or salmon fillet, and it'll be great. Or you can just leave it out. This dish was so heavenly, but not diet friendly... in large part because it is so addicting that it's hard to just eat one serving. To keep this dish more frugal, use homemade coconut milk for this recipe. 1. Soak your rice noodles in boiling water while following the following steps. 2. Dice your onions, chop your mushrooms into quarters or slice them, and cut your chicken, tofu, or salmon into cubes. 3. In enough oil so it doesn't stick to the pan, saute your onions until golden, add your mushrooms and saute until browning, and then add your protein and cook until fully cooked. Add more oil as needed. Remove from the pan when fully cooked. 4. Mix your coconut milk with your curry paste, then add salt to taste. Remove a bit of the sauce and set it aside to cool. Mix in your soaked rice noodles to the bulk of the sauce, and cook in the sauce for a few minutes, or until fully softened. 5. Mix your starch with the sauce that you set aside, and then add to the pot of noodles. Cook it all for a few minutes until it has thickened. 6. Add your onion, mushroom, and chicken/salmon/tofu mixture to the noodles, and mix well. Are you a fan of Thai food? Ever have a dish like this before? Does this look like a recipe you'd try? What protein are you most likely to use for this? I love Thai food, but I've never had a dish like this before! How interesting. I would love to give it a try, but I'm 1,000% sure my kids wouldn't even try it it. By the way, I'm DYING to read about the rest of your vacation!!! I know your family has been sick, so I'm sure posting about it hasn't your top priority. This looks delicious and quite simple. I love Thai food, so I will give it a try!